These frames have come a long way since Ted’s first build. I spoke with him extensively about frame design and to call Ted an artist is an understatement. He’s a craftsman and a frame builder. He researched materiality and threw out the rules on geometry and went with “what felt right”. I was pretty impressed with Ted’s ability and overall, the work he’s doing at Shop 14 is awesome. 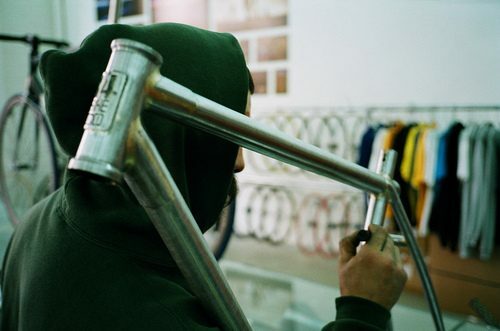 Mikey posted some pictures on 14 Bike Co’s blog of the frame before everyone signed it. Here’s Super Ted, the designer and builder of the ESB, giving it the first note with a marker. Ted, here’s a new joke for you. What did the young pirate decide to go to college for?